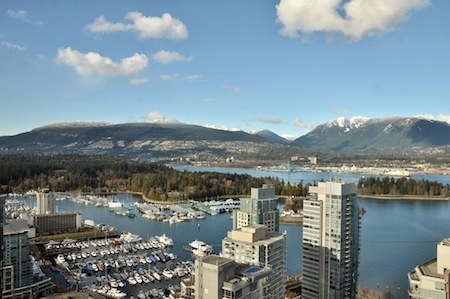 Incomparable sweeping views define this luxurious fully furnished residence in Vancouver's ultra desirable, prestigious Coal Harbour neighbourhood. 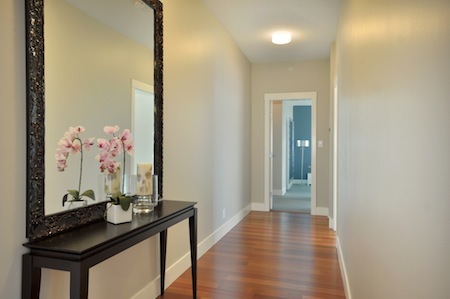 Over 1900 square foot surrounded by contemporary elegance it is the perfect natural setting. Instantly feel at home in this exceptional suite complete with select art works, media and total furniture package. 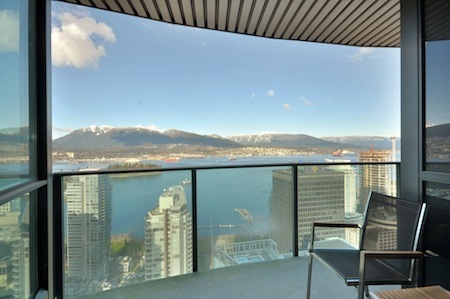 Appreciate the finest improvements including custom built-ins, an entertainment system, gleaming hardwood flooring, quality window shades and world class views throughout the home. 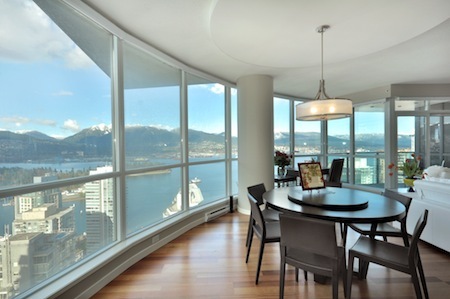 The spacious and relaxed setting for meals is adjoined by a partially enclosed Northwest facing balcony framed by perpetual vistas of Coal Harbour, Stanley Park, English Bay and the North Shore Mountains. You can see the view from anywhere in any room. 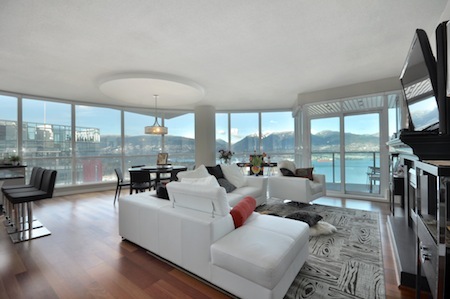 The main living area is spacious and inviting with soaring ceilings meeting floor to ceiling windows with unobstructed views of the water, the mountains, the marina and the Coal Harbour sea plane base. Featuring hardwood floors in the living area with generous fine rugs and pure wool carpets in all three bedrooms making the floors cozy. Leather sofa and chairs make plenty of space to stretch out. 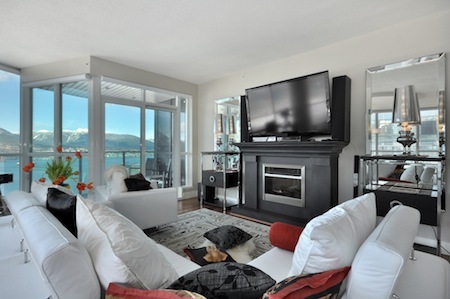 There is an electric fireplace and above a giant 60 inch LCD flat screen TV featuring over 70 cable channels. 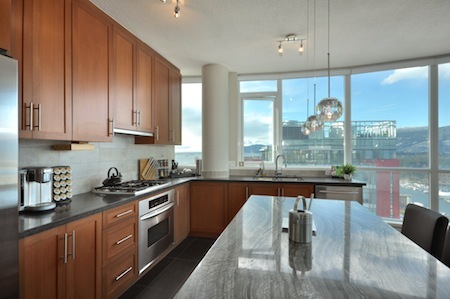 Order in, cook for friends and family, or business partners, in the spacious open plan gourmet kitchen featuring all stainless steel top commercial-brand appliances. There is everything you need to prepare an entire menu-de-cuisine and for the barbeque lover there is a stylish Weber portable gas grill. While dining, watch the cruise ships sail by and the float planes land at your doorstep. 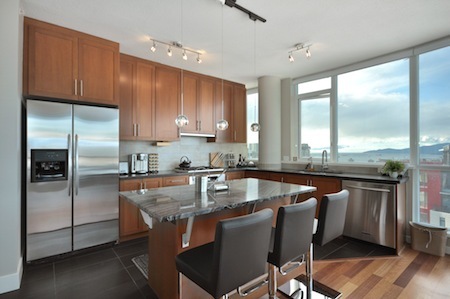 Take pleasure in watching the commanding waterfront panorama even while you cook. For those who come for business, there is a high quality office desk set up at front of the window in the living room. Feel free to use the HP All-in-One Inkjet Printer with ePrint and AirPrint. Along with this come high speed wireless internet access and local phone service. 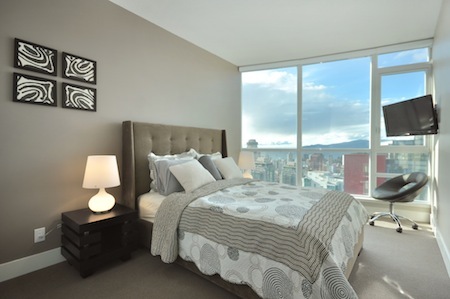 All three bedrooms offer a different, breathtaking view of the city, mountains and ocean from the floor to ceiling windows. It goes without saying that all beds come with first class bedding and luxurious mattresses. The rooms all have wall mounted flat screen TVs and window blinds that can be remotely operated. 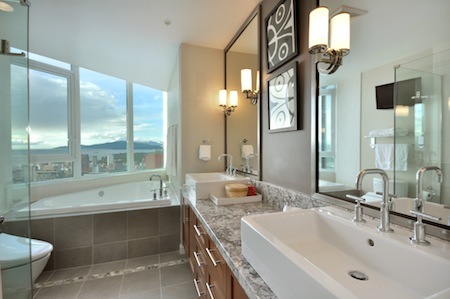 In addition, each features a full set ensuite, granite bathroom. 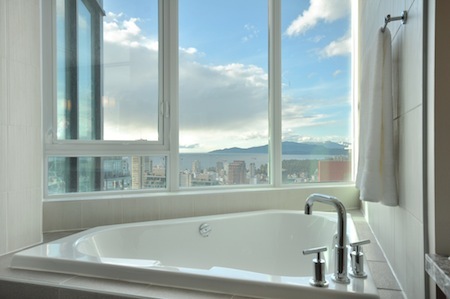 The master bathroom includes a stand-alone shower, heated toilet seat, TV and jacuzzi tub with amazing views to English Bay. The building is fully secured with key-fob controlled access, gated underground parking, 24 hour security and electronic access limited to your floor. The common amenities are located on the third floor and roof top. Enjoy your workout, swimming in the outdoor pool and relaxing in a sky garden at 400 feet with panoramic views. On the third floor there is a common area with a pool table, video theatre and meeting room which need to be reserved. The location is second to none! Imagine starting your morning with a stroll on the famous seawall, only steps from your front door. Consider cycling the seawall directly to English Bay or Stanley Park. Bikes and roller-blades rentals are available nearby. 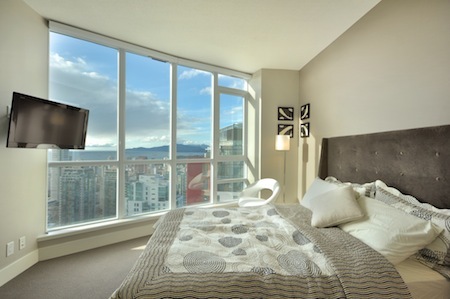 For those who love to shop, stylish Robson Street and Pacific Center Mall are a few minutes walk away. Just 2 blocks away there is Urban Fare Market, Vancouver's trendiest, upscale grocery with restaurant, take away and coffee bar. 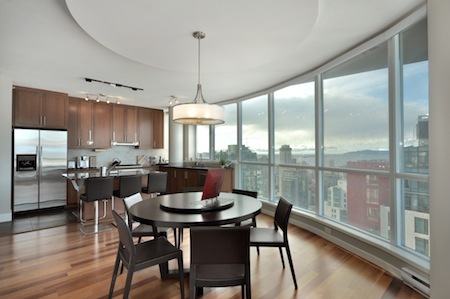 This unit and its location defines west coast luxury at it's best. Please note a minimum stay of 3 months is required. My stay in this property was wonderful. The property is gorgeous, comfortable, clean and has beautiful and modern decor. Normaly the pictures on the real estate sites are better than the real property is, but it was the opposite. The apartment is much better than the pictures on the EMR website. Congratulations EMR, you all have done a great job. Since the begining of the rental process with Heather very efficient, Jack who really was very kind with us when we had a little problem, and Isabel our greeter who is a very sweet person. 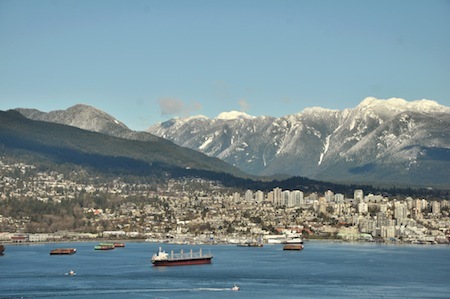 Thank you very much and I'm looking forward to coming back as soon as possible to this beautiful City of Vancouver and I hope to be in the same property. We are from Texas. Our stay at our vacation condo was perfect. 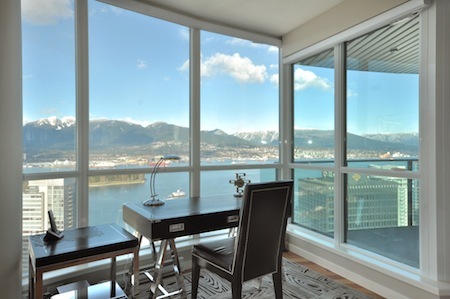 We rented a week's stay in Vancouver, Canada at the Horizons and everything was great, the view, accommodations, service, and price. We were nervous because we were going to be in another country and we had no idea if the pictures on their website were going to be accurate. However, everything was exactly like the views on their website. We rented a 3 bedroom, 3 1/2 baths. It was just right for our son and his girlfriend, my daughter, son-in-law and baby, and for my husband and me. It had everything that you would need in a home and it included a washer and dryer. We also requested a swing set and travel play pen to rent and they took care of everything. It was all set up and ready to be used when we arrived. We arrived late at night and they were so accommodating and were there to greet us and show us everything in the condo. 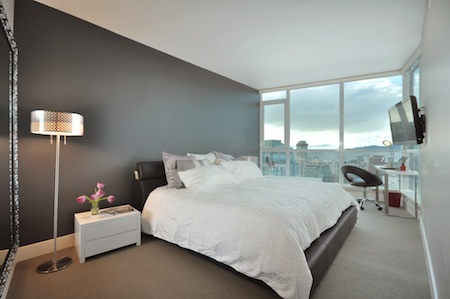 We would recommend EMR Vacation Rentals and will definitely use them in the future. My son also left a cable for his IPad behind in their room and they were so nice to mail it back to us. Great service.